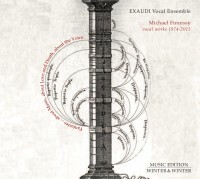 EXAUDI’s second Finnissy disc shows the composer’s vocal writing at its most blazingly extreme: displays of virtuosity that push mind and body to the limits of their flexibility, reach, stamina and control. There are four pieces on the disc: Gesualdo: Libro Sesto (2012-13), Cipriano (1974), Tom Fool’s Wooing (1975-8/2015) and Kelir (1981), each of them a tour-de-force of virtuoso singing and overwhelming expressive intensity. In 2006 EXAUDI performed Brian Ferneyhough’s iconic Missa Brevis (1969) at the Aldeburgh Festival. 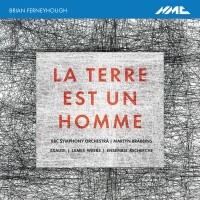 Of that performance the Guardian wrote that ‘there are some performances that you know will be etched on your memory forever, such is their intensity and power.’ Recorded live by the BBC that day, it is now available on CD alongside major orchestral and chamber works by this leading British composer. 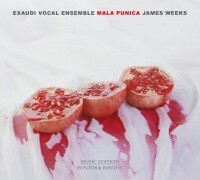 James Weeks’ Mala punica for eight solo voices (2008-9) takes its inspiration from the vision of an abundant, fertile natural universe that defines the biblical Song of Songs: ripening figs, budding pomegranates (the mala punica of the title), flowers swaying in a gentle breeze, rising plumes of smoke are all translated into musical images and coiled into canonic textures. Around it, a group of six instrumentalists – interlocked trios of strings and flutes – play the three pieces of Walled Garden (2015), described by the composer as ‘a soil for the vocal songs to take root in’, and depicting a garden at dawn, midday and dusk. James Weeks’ mural is a book of more than seventy short pieces on themes of the domestic and everyday, the spaces we live in and the ways we construct and inhabit our world. The texts come from four sources: fragments of the poems of Alberto Caeiro (a heteronym of Fernando Pessoa), quotations of John Cage, critiques of Vermeer’s painting The Little Street, and descriptions of the bird life of Gateshead, the composer’s home town. Two quartets of singers quietly pass these texts, fragmentary and transformed, back and forth. 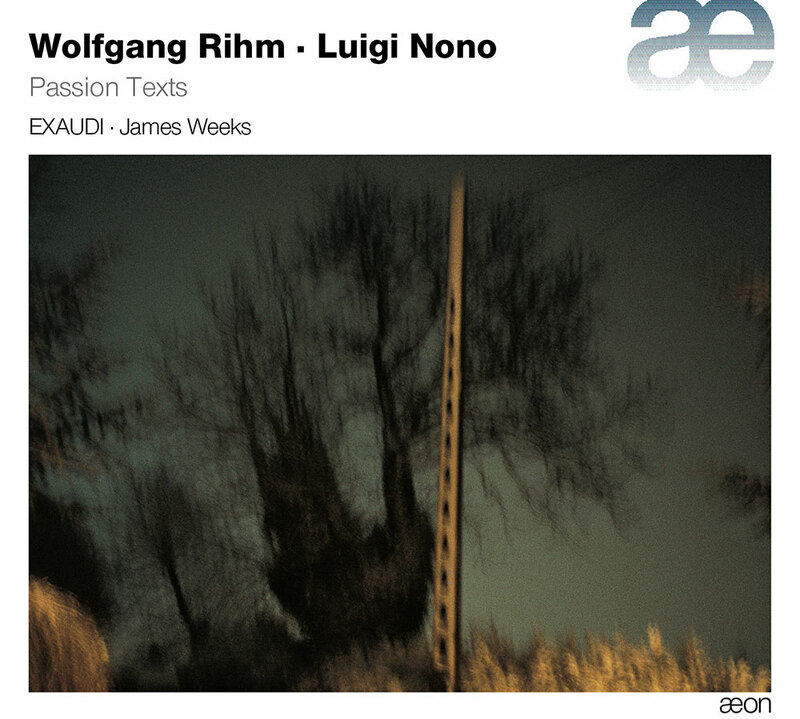 The vocal works of Luigi Nono and Wolfgang Rihm shows a passionate engagement with their fellow human-beings, giving rise to a music of searing and shocking directness. The human soul stripped to a mouth, a mouth opened in transcendental suffering – of the relatives of the disappeared in Argentina, of Jesus on the Cross – or closed in defiant compassion for the victims of AIDS. A mouth that can also sing of the violent cataclysms of creative ecstasy and the quiet lyricism of a peaceful Utopia. 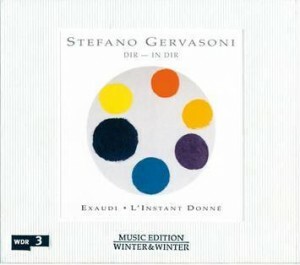 EXAUDI are joined by L’Instant Donné on this CD of two interconnected works for voices and strings by Stefano Gervasoni: “Dir – in dir”, and “descdesesasf”. 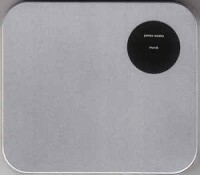 Read this review on the Five against Four blog. EXAUDI’s second CD devoted to the music of British experimentalist Howard Skempton focuses on his jewel-like miniatures for vocal consort and for solo piano. Skempton’s unerring ear for the grain of vocal textures yields ravishing results in pieces like the Five Poems of Mary Webb, for three female voices, and the Two Poems of Edward Thomas. As a counterpoint to the vocal items, pianist Daniel Becker offers a varied selection of recent piano pieces as well as the ever-popular Durham Strike and Well, well, Cornelius. Taking his cue from both The Beatles and Morton Feldman, from experimentalism and folk, Skempton’s music is a unique phenomenon. In 1998 leading contemporary British composer Christopher Fox began work on a new commission, a piece that was to be ‘evening-long, and not a concert’. The result was the quasi-dramatic ‘installation piece’ Everything You Need to Know – a body of musical material which can be deployed in many different ways. 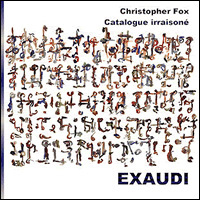 Fox realised that the work needed a guide – a parallel version of the same ideas in a different form, rather like the ‘catalogue raisoné’ at an art exhibition. 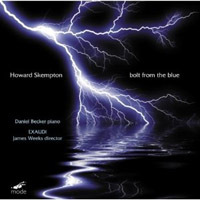 Thus was born a series of pieces for solo voice, as recorded here for the first time under the supervision of the composer and with his appearance as narrator. The sections are based on a series of multiligual texts from various sources including Virgil, Dante, tourist guides and essays. The ‘catalogue’ is about ideas, remembrance and the possibility of improbable connections. In itself as a sound work it is absolutely and positively unique. This collection contrasts Skempton’s choral works – including the dancing setting of Shelley’s The Voice of the Spirits and spiritual Rise Up, My Love – with chamber music ranging from the Suite from Delicate, for 2 cellos and percussion, to the exuberant (yet very English), Chamber Concerto. The title piece, Ben Somewhen, for solo double bass and ensemble, and was inspired by Ben Hartley’s drawings of rural life. A tribute to this radical and influential composer in the centenary of her birth, this CD presents a selection of Lutyens’ varied and inspirational choral works – including the Motet setting of excerpts of Wittgenstein’s Tractatus Logico-Philosophicus, and the Chaucer setting The Country of the Stars – with a series of instrumental pieces including the fearsomely difficult String Trio and the lyrical Presages for solo oboe; it is performed by EXAUDI and Endymion. EXAUDI’s second recording for NMC features choral works by Christopher Fox with the common theme of Puritanism, Liberty and dissent. American Choruses is one of the composer’s earliest works, exploring his relationship to an American tradition which includes Ives, Cage and the poetry of Walt Whitman. In A Glimpse of Sion’s Glory, conflicting lines voice the idealisms of protestors including the histoical Levellers’ movement and John Milton; and the monolithic Missouri Harmony for solo organ evokes the meditative aspect of Shaker worship. Rendered Account, setting Ian Duhig’s lively political verse on the nature of walls and boundaries, and Open the Gate, with its basis of plainsong, complete the disc. 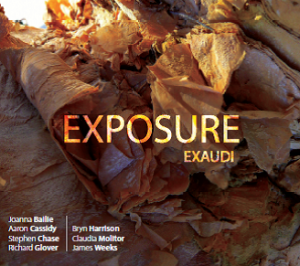 EXAUDI’s debut CD on NMC is a thrillingly intense disc of music by Michael Finnissy. Maldon sets Anglo-Saxon texts of battle for an impressive ensemble of voices, trombones, organ and percussion; other works feature Michael Finnissy as part of a piano duo (in Vertue) and Howard Skempton on accordion (in the setting of Scots poet William MacGonagall’s travels, Descriptive Jottings of London).